Prolonged “zeee” and metallic “chip.” Song is slow musical trill, all on one pitch. Description: Sexes similar. 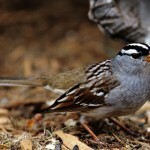 Breeding adult has rich rufous upperparts and wings, with variable black streaking on back; grayish breast with faint streaking; whitish belly. 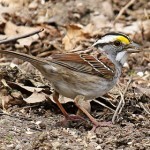 Gray face with thin black mustache and crown stripes; white throat; and reddish crown. Winter adult is buffier overall; crown is streaked with gray central crown stripe; and rich buffy sides. Juvenile is even buffier, with heavy streaking on breast and sides. 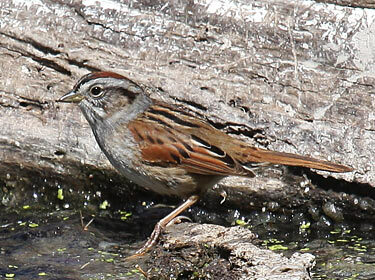 Behavior: Pumps tail while in flight, similar to other Melospiza sparrows. Habitat: Fresh and brackish marshes, swamps, and streams. Nesting occurs in marshes or wetlands with dense, tall vegetation such as cattails, phragmites, and shrubs or small trees. 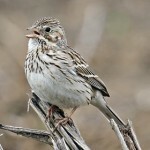 Where in Nebraska: Uncommon spring and fall migrant in eastern Nebraska, becoming very rare in the west. Rare and local summer resident in appropriate habitats. Fun Facts: They begin singing in the morning and will sometimes sing throughout the night if there is moonlight.